My husband John and I are extremely lucky. For us, stunning scenery and stellar wines are a part of daily life and work (if you can call it that) in the Napa Valley. 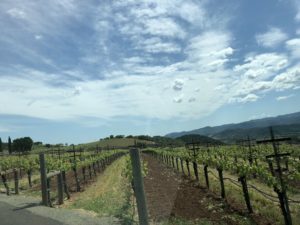 On Tuesday, May 1, 2018, we experienced a pinch-me bounty of both, at an amazing vertical tasting of Dalla Valle Cabernet Sauvignon. The iconic proprietress Naoko Dalla Valle had invited us and a few other trade friends to this gathering with her vineyard and winemaking team, including daughter Maya and winemaker Andy Erickson, to taste every Dalla Valle Cabernet vintage ever released, from 1986 to 2015. The goal of this complete retrospective tasting, which as Naoko explained is undertaken about every five years, was to assess the wines’ development and condition, share observations about the vintage characteristics and farming/winemaking approaches at the time, and add to the team’s repertoire of understanding the flavor and style characteristics of this singular estate property. It was incredible to be along for the ride (thank you, team Dalla Valle! ), and to make some of my own conclusions, which I’ll share below. But first, a little background. Perched at 400 feet above the Silverado Trail on red volcanic soils in the Vaca mountains that flank Napa Valley to the east, the property, in the Oakville AVA, was purchased by Gustav and Naoko Dalla Valle in 1982, with the intention to plant vines and pursue their vision of crafting a Grand Cru-level wine in Napa Valley. It is really rather amazing to think that just four years later the inaugural vintage, 1986, could have yielded a 30-year wine (more on that in my notes below), given that these were baby vines, planted before precision viticulture for Napa Cabernet, which emerged following the massive phylloxera replant in the 1990s and is now the norm among great properties, was even a thought. As Naoko puts it, the early days were simpler. “It was like, call me when the brix hits 23.5,” she recalled as we reviewed the first decade’s wines. Yet Dalla Valle were early adopters of grape-growing as a major focus, sensing that their property had something distinctive to express, and determined to showcase it. Although I have read comments about the early Dalla Valle vintages being more acidic and lacking concentration, I was truly impressed with the complexity and staying power of many of the early bottlings, including the tricky 1989 vintage, an awesome bottle which was my 3rd favorite in the flight (see notes below). The common thread in the 1986 – 1995 flight was red fruits, floral notes, and a lifted scent that was sometimes minty, and sometimes more eucalyptus/sassafras. 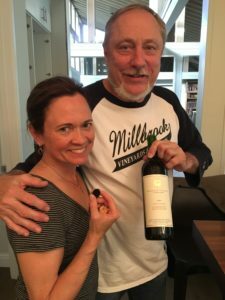 The bottlings from 1996-2005, with Tony Soter and Mia Klein directing viticulture and winemaking, began to show the benefits of precision farming following a replant of portions of the vineyard that had succumbed to disease. The wines show more black fruits and concentration. In addition, a beguiling tar-and-char, savory minerality emerged as a consistent base note expression, carrying right into and through the 2006-2015 flight. The stamp of the terroir? I think so. The other constant in these wines is their longevity. 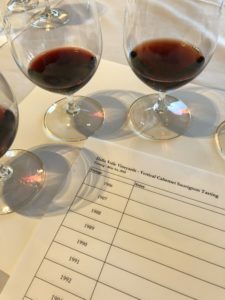 Simply put, they are easily 30-year wines, though you can cheat to 20 years with wines like the 1997, which was a welcome surprise for John and me as we have been finding a lot of the lauded Napa 1997s to be going downhill. To celebrate, we drank one of the 1997s from John’s cellar with my dear friend and mentor–the great Kevin Zraly–the following weekend. Before I share my notes, a little bit about the notion of a Grand Cru or “first growth.” I believe it means: a wine that gets better with age, from a place that imprints style characteristics on the wine’s scent and taste, stewarded by people or a team inspired by and working to pursue the goal of showcasing their wine’s expression of its place. By that definition, we definitely have some Napa Valley first growths, and Dalla Valle is one of them. If you are lucky enough to own or have access to some of these wines, I bet that musing on that idea will enhance your enjoyment, and I hope these notes will enhance your exploration of them. Note: the wines evolve with air and time in the glass, bringing succeeding waves of new expression and energy. So, take your time and give them their due. My drinking window notes below assume optimum cellar conditions. 1986 – Mint, warm berries and sweet plum on the nose. Leather, horehound candy, brown sugar, mincemeat & balsamic on the palate.Long, minty finish, beautiful. Very soft and ready. 1988 – Limpid garnet/terra cotta, brown tinges. Brown sugar and leather, very developed consomme nose. Ginseng/digestif/rooty and herbal quality (like Fernet). Fading a little, but still long finish. Drink over the next 5 years. 1989 – Opaque garnet/scarlet. Mint, eucalyptus, meat, juniper. Very grippy, powerful and meaty on the palate. Dark plums, chocolate, velvety tannins, some leather and vanilla. Still showing some youth and stuffing. Long fruit- and cocoa-driven finish. Rainy year, but they picked before the rain. 3rd favorite of the flight. Seven to 10 more years, no problem. 1990 – Dark rusted garnet with terra cotta rim. Mint and sweet dark berries, sweet spice, herbal/Fernet and vanilla nose. Sill plenty of life left. Firm but integrated tannins, bright cedary acid, demi-glace, dark berries, mint, juniper, cedar, cinnamon. Super complex! Favorite of the flight, 15 years to go, easily. 1991 -Opaque garnet fading to slightly oranging rim. Bright red berry, cedar, cinnamon nose. Tightly-wound and dense on the palate with dark plum, fudge, sweet tobacco, velvety-rich tannins, long mint-and-tobacco finish. 10-15 years to go. 1992 – Dark garnet w/ruby-orange rim. Oak sticks out on the nose, as well as red fruit and floral notes. Really needs time. Savory, chewy core of sweet fruit isn’t yet integrated with the oak, but it’s all there and this one really needs time–5-7 years to come around and then should plateau for an extended drinking window. 1993 – Dark garnet w/ruby rim. Initially, oak dominates the nose and palate, but with air and time, the red and black fruits and complexity begin to emerge. I think 5-7 years’ additional aging will put it in the sweet spot. 1994 – Dark garnet, ruby rim. Oak and red flowers on the nose. Dense, packed-in palate of red and black plums, sweet spice, molasses, potpourri. Needs 10 years but very complete and complex. Long fruit-and-spicy oak finish. 1995 – Dark ruby. Sweet mint and potpourri nose, raspberry fruit leather. Very spicy, savory, eucalyptus, coriander, dry rub. Very complex, spicy-cedary on the palate, dark fruit leather and chocolate. Long, chocolate-cherry finish. It is beautiful now but will likely reach another plane of complexity in 5-7 years. 1997 – Ruby/garnet. Black fruits, eucalyptus, mint, sweet chocolate. Palate is very packed-in and yet fresh. Blackberry, cinnamon, tea, charry minerality, long sweet fruit and vanilla finish. Beautiful now but easily a decade of life left. 2nd favorite of the flight. 1999 – Opaque ruby. Very sweet kirsch, vanilla, chocolate and dark soil scents on the nose. Palate incredibly dense and concentrated with dark berries, cinnamon, chocolate, char, vanilla all carrying into the finish. Come back in 10 years. 3rd favorite of the flight. 2000 – Dark ruby. Nose of cedar, coffee, cinnamon, dark fruit, graphite is very complex and almost Bordeaux-like. Palate of allspice, clove, dark berries, cocoa is very hedonistic and seductive. Long, char-tar finish. Surely one of the sleepers of the vintage, and my favorite of the flight. I love the opulence now but it will cellar well for 10-12 years. From here on out, nearly all of the wines would really best be cellared at least another decade to reach their full potential. 2001 – Nose of black cherry pate de fruits and chocolate ganache. Palate is densely-packed, velvety with dark cherry, licorice and vanilla bean. A beautiful baby that will reward 12-15 more years of cellaring. 2002 – Bewitching floral, savory hoisin-ginger-fermented black bean notes and the signature tarry minerality. It is an exotic, glycerin-y meal-in-the-glass that I love now but it will hold and evolve nicely for another 10-15 years. 2003 – From the color density it could easily be a current-vintage wine. Nose of glazed dark cherry, cacao, vanilla. Palate is bright and fresh with sweet baking spice, cedar, cherries, red licorice, black tea, char and cinnamon. Pretty now but with 10-15 years to go, easy. 2004 – Extremely youthful. Dark plum and chocolate ganache nose. Palate of ripe black raspberry and vanilla fondant with a long char-tar finish. Needs 10 years to reach full potential. 2005 – Dense purple color. Nose shows dark cassis, chocolate and a seductive tar-mineral twang. The palate is all abundant and dense, dark fruit, chocolate, black earth. Come back in 12-15 years. 2006 – Feminine and perfumed, with a sweet/savory, lifted mint and chocolate nose. Incredibly fresh acidity on the palate with sweet red fruit, red licorice and floral notes. Quite pretty now but has more to reveal over 7-10 years. 2007 – Textbook Napa. Dark black fruits with a savory-saline topnote. Palate of sweet cassis, cedar, vanilla, allspice. Very complete and needing at least 10 years, with a long life ahead after that. 2008 – Pretty tight and quiet right now. Nose of dark berries, vanilla and sweet tea. Palate of blackberry, vanilla, dark licorice, cocoa and tar. Come back in 10-12 years. 2009 – Savory nose with black tar/char notes and Asian spice. Palate is also savory, with dense fruit, braised meat, ginger, clove and licorice notes. Very complex now and aeration brings it around even more. Will hold and improve for 12-15 years easily. 3rd favorite of the flight. 2010 – Very complex nose with floral, raspberry and savory-meaty notes. Packed-in fruit and coffee-cocoa-minerals on the palate. Very classy and subtle. Needs 12-15 years. 2011 – Love this nose: coffee, cocoa, dark berry. Palate shows the distinctive charry minerality that I keep finding in these wines. Elegant and savory with sweet spice and tea notes. A triumph for the vintage and pretty now with aeration, but will hold and improve another 15-plus years. 2nd favorite of the flight. 2012 – Extremely complex and dense nose marked by cedar and cola. Palate has insane concentration, depth, black tar minerality, with cocoa-chocolate-mineral finish. Favorite of the flight. Needs 20 years. 2013 – Nose of cherry-chocolate, cola, cocoa. Packed-in dark fruits, glycerin, char and cedar. An infant of a wine – come back in 20 years. 2014 – The nose is awash in mineral-saline notes, then dark berry and black cherry fruit. Fresh acidity courses through the dark and charry/tarry, saline, mineral savor on the palate. Another baby, as excpected. 2015 – GREAT nose – cherry-cola and espresso bean. Sumptuous black forest cherry cake palate, lavishly ripe but tautly wrought in terms of structure and sinew, so it will evolve magnificently over decades. 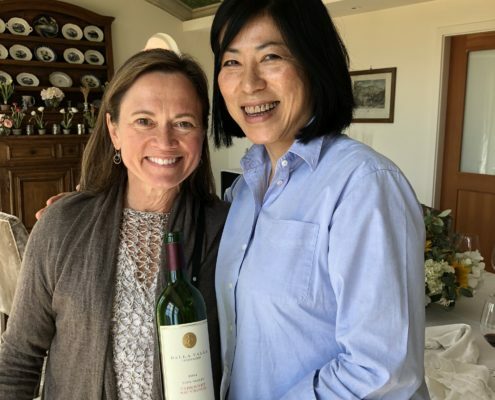 Thank you to Naoko, and now daughter Maya (for whom their jewel-in-the-crown, very limited Maya bottling is named), for your commitment to the creation and nurturance of a Napa Valley Grand Cru.